The Air Jordan VI storms back this Saturday with two colorways releasing on the 23rd anniversary of the first time Michael Jordan wore what would be his first championship sneakers. 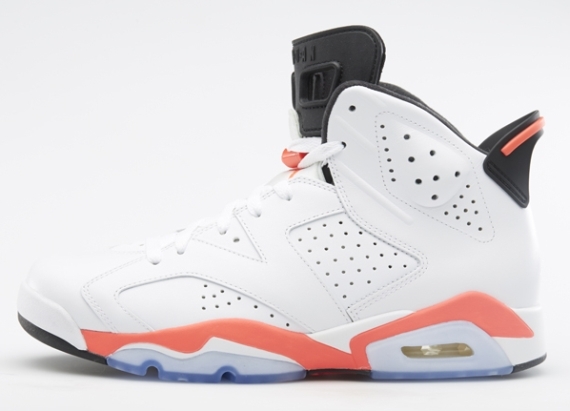 Along with the brand new ‘Infrared 23’ edition, this classic 1991 original ‘White/Infrared’ Jordan 6 Retro will reintroduce a model that figures to be one of the more significant across the year. They’re dropping along with a full complement of apparel in full family sizes which takes you all the way down through toddlers, so get ready by checking out some new photos below and let us know if these rank among your favorite OG Air Jordans.